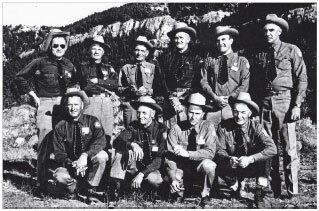 The Wyoming Game Wardens Association was formed in 1973 for the purpose of furnishing a medium for good fellowship and loyalty to the Wyoming Game and Fish Department and fellow officers, effectively maintaining the wildlife resources of the State, promoting a more efficient and able force of game wardens and to meet our responsibilities and problems collectively. The Association is classified as a nonprofit charitable organization for tax purposes. 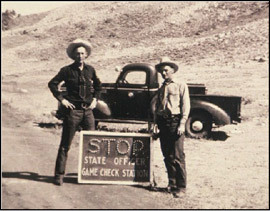 The WGWA is in no way officially linked with Wyoming Game & Fish Department, a state agency, although most of its members serve the agency and, by extension, the people and wild resources of Wyoming. 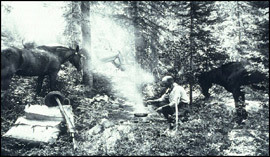 Views, comments, and opinions expressed in this website are those of individual members, the Association as a whole and are not to be construed as necessarily reflecting the current policies, views or opinions of Wyoming Game & Fish Department or the Wyoming Game & Fish Commission. 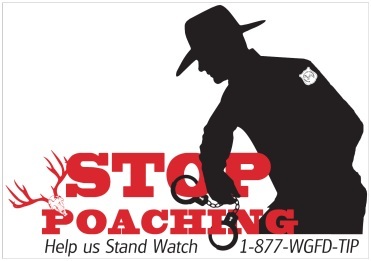 The "STOP POACHING" program is an opportunity for you to help protect your wildlife resource. Rewards are paid when an arrest is made or a citation issued. 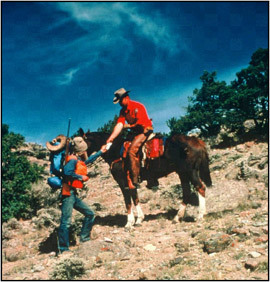 The program works because people care about Wyoming's wildlife. 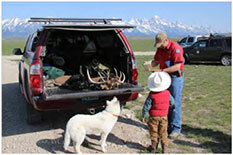 YOUR CALL WILL MAKE A DIFFERENCE - REPORT ALL WILDLIFE VIOLATIONS. 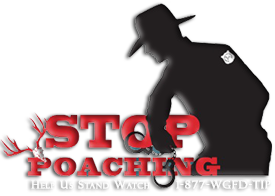 The "STOP POACHING" Hotline phone number is 1-877-WGFDTIP (1-307-777-4330 or 1-877-943-3847 for out-of-state calls; or Text keyword WGFD and message to 847-411 *Android based cell phone users may download a free app to their phone to facilitate these text messages. 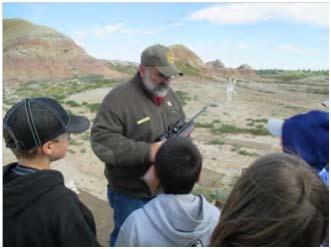 Lovell Game Warden Dillon Herman instructs students at the air rifle station. 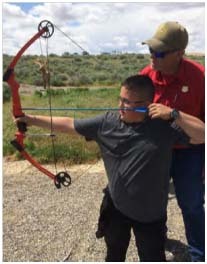 Cody Wildlife Supervisor Dan Smith instructs a student at the archery station. 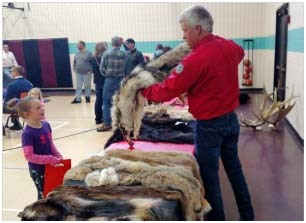 Buffalo Game Warden Jim Seeman shows a Healthy Kids Day event attendee a gray wolf hide and explains the difference in size between a wolf and a coyote. 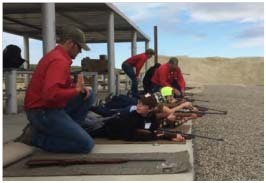 Worland Game Warden Matt Lentsch reviews firearms safety with participants. 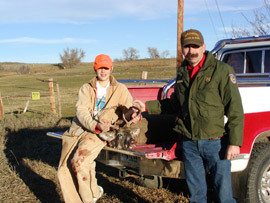 Sheridan Game Warden Bruce Scigilano checking a young hunter’s kill. 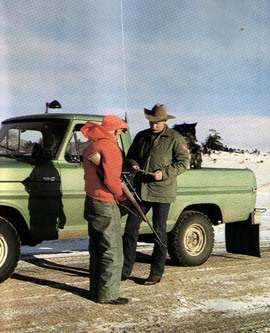 Cheyenne Game Warden Chuck Repsis (Retired) checking a big game hunter. 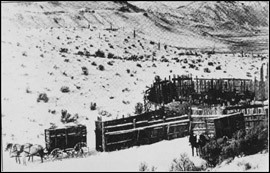 Early elk trapping and relocation efforts. Torrington Game Warden Adam Hymas and Wheatland Game Warden Craig Smith transplanting turkeys into a new area. 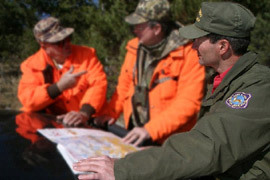 Director Scott Talbott checking hunters in the field. 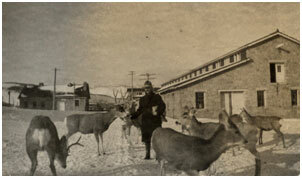 Jackson Game Warden Nate Wilson feeding deer in the winter of 1918. 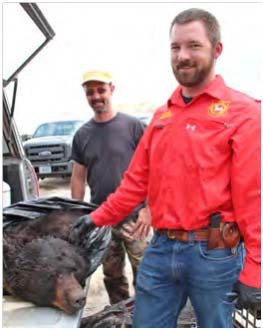 South Riverton Game Warden Chris Daubin necropsing a poached bull moose. 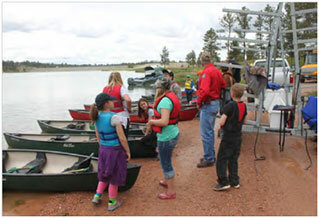 Moorcroft Game Warden John Davis explains the rules for the canoe race to one group of the Rozet 6th graders. 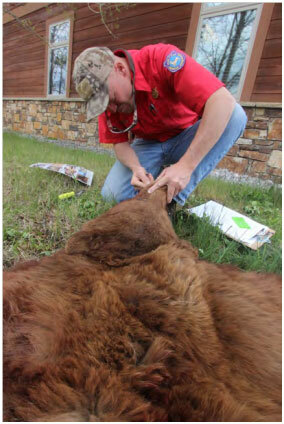 North Jackson Game warden Jon Stephens check in a hunter harvested black bear. 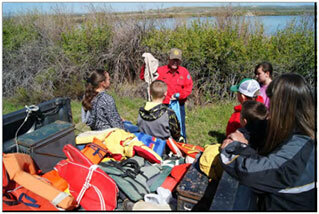 Saratoga Game Warden Biff Burton discusses water and boating safety with an Encampment School class. 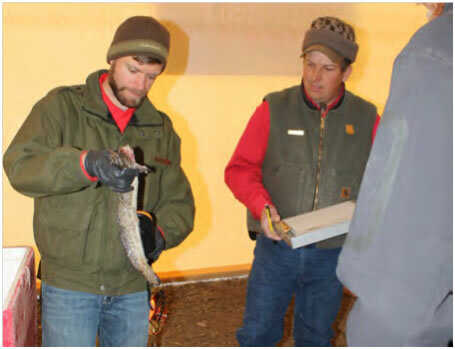 North Gillette Game Warden Brooke Weaver helped stock the 500 rainbow trout in Panther Pond. 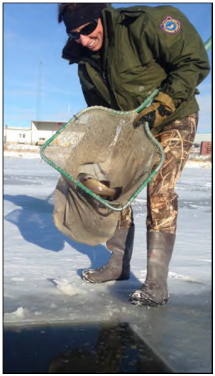 Game Warden Andy Countryman assisting with burbot measuring. 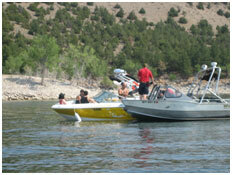 Wheatland Game Warden David Ellsworth conducting a watercraft safety inspection. 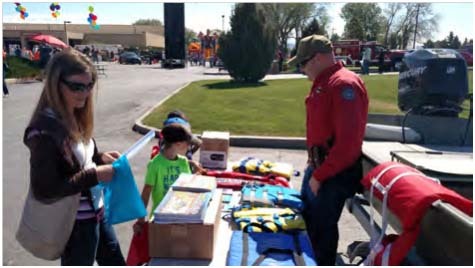 Law Enforcement Coordinator Aaron Kerr visits with a family about boating safety. Rawlins Warden Teal Joseph patrolling the waters. Evanston Game Warden Nick Roberts at a school program. 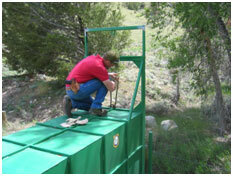 Rock Springs Game Warden Andy Roosa checking in a black bear. 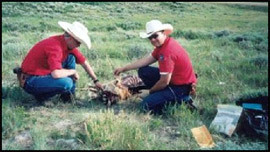 Pinedale Game Wardens Bubba Haley and Brian Nesvik investigating a wanton waste of an antelope. 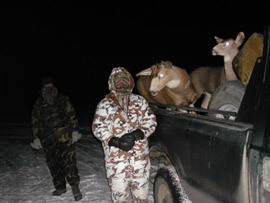 Officers conducting deer decoy operations. Cody Game Warden Tim Fagan glassing over his area. 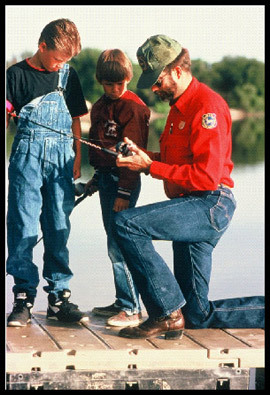 Lander Game Warden Bob Trebelcock giving some helpful hints to a couple of young fishermen. 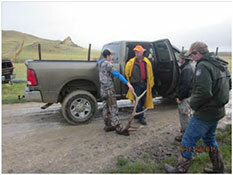 Casper Access Coordinator Brian Olson going over Walk-In Areas with hunters. North Rawlins Game Warden Bill Brinegar relocating a nuisance black bear. 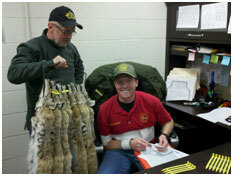 South Jackson Game Warden Jerry Longobardi checking outfitter camps. 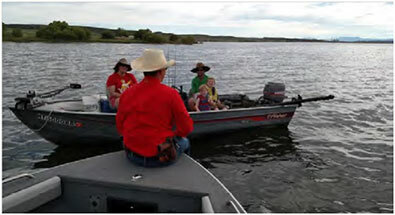 Game Wardens checking boaters on Glendo Reservoir. 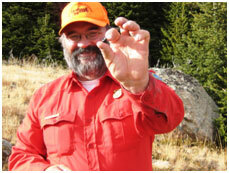 Worland Game Warden Matt Lentsch finding the bullet in a poached deer. Jackson Game Warden Kyle Lash applies an Interstate Game Tag to a young antler hunter’s elk rack found adjacent to the elk refuge. 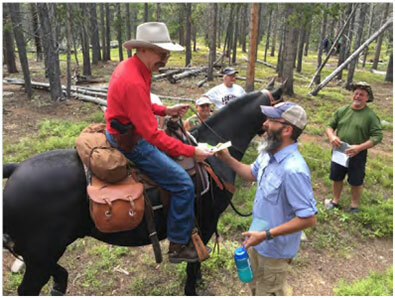 Buffalo Game Warden Jim Seeman (yellow slicker) and Wildlife Biologist Dan Thiele (far right) visit with two antler hunters about their experience on the Bud Love WHMA on May 15. 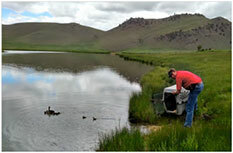 Jackson Game warden Kyle Lash releases a family of ducks at the national Elk Refuge near Jackson. 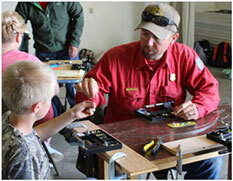 Lovell Game Warden James Hobbs shows a Worland Outdoor Day participant how to build a fishing lure. 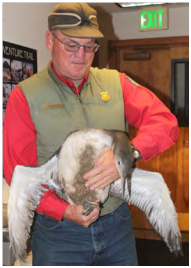 Rock Springs Game Warden Dave Hays picked up a stranded loon from a residence in Rock Springs. The bird landed in a yard and, because their feet are located far back on their body, the loon could not walk. Loons are swimmers. Hays found some open water and let the loon free. 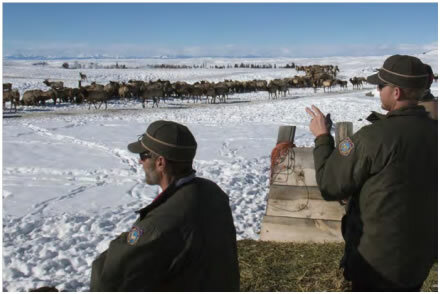 Pinedale Wildlife Biologist Dean Clause and South Pinedale Game warden Jordan Kraft count elk at the Fall Creek Feedground southeast of Pinedale. 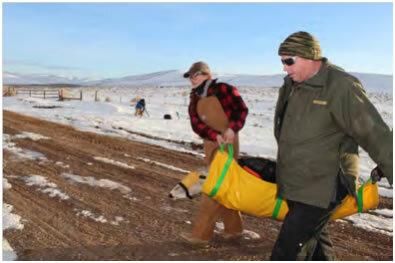 Cokeville Game Warden Neil Hymas helps UW researcher carry mule deer. 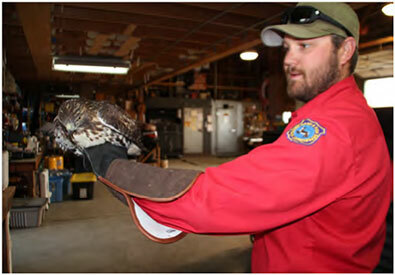 Green River Game Warden Levi Wood with an injured Red-tailed Hawk. 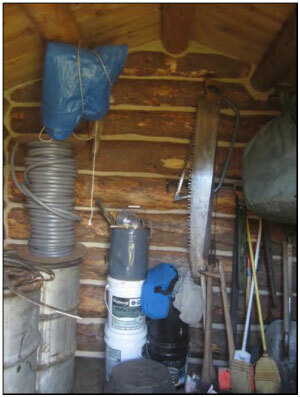 Before and after photos of the storage shed at the Thorofare Cabin. 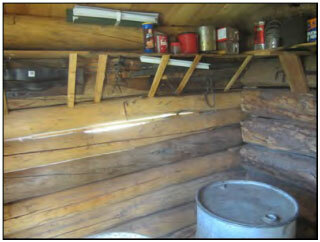 The cabin was recently rechinked as part of ongoing maintenance efforts of backcounty facilities. 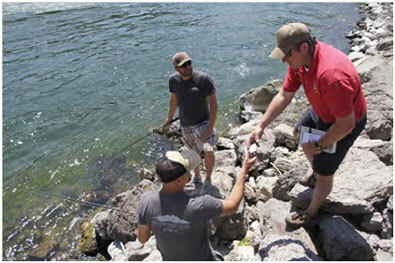 Jackson Game Warden Kyle Lash checking fishermen. Jackson Game Warden Kyle Lash checking drift boat fishermen. 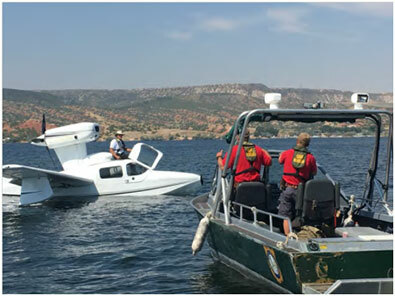 Watercraft Patrol Game Wardens experiencing a new situation. 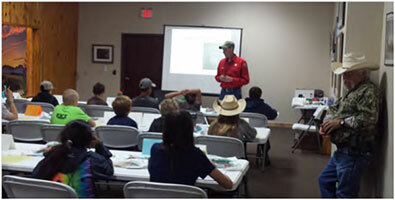 North Cody Game Warden Travis Crane teaches the game laws and regulations section of a recent Hunter Education in Cody at Cody Firearms Experience. 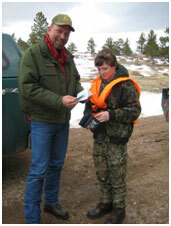 Sheridan Game Warden Bruce Scigliano checking anglers' licenses in the back country.